Honeybees – we’ll talk a little bit about honeybees, how they live, how they work, what they do, who lives inside the hive, and other issues. The honeybee colony is made up of a queen bee, drones, and worker bees. The queen bee lays about 2,000 eggs per day. There are also drones inside the hive, they’re the male bees. The male bees’ only job in life is to mate with the queen, otherwise they pretty much lay around and don’t do much of anything except mate with the queen and die. Also, you have workers in the hive. All the bees except for drones and queen are workers. Workers are all female bees, they are not fully matured female bees. The only fully matured female bee is the queen. The queen lays all of the eggs for the entire colony. She can lay over 2,000 eggs per day in the summertime. The bees live in a hive. A wild hive could just be a hollowed out tree. Nowadays most beekeepers keep bees in a box called a Langstroth box [or hive], and this is a typical rectangular shaped box about 16 inches by 20 inches. These boxes come in several different thicknesses or depths. You’ll have the deep boxes, which are typically used as a brood chamber. This is the next, this is where the honeybees live and raise their young. Above that you’ll have honey supers. These are a little thinner, they’re about five or six inches tall. This is where the honey is stored in the hive. You’ll typically have a queen excluder in between the honey supers and the deeps. The reason for this queen excluder is so that the queen does not lay eggs up in the area where you want to extract your honey. The bees will raise more honey than what they can possibly use in a winter. This is the reason why we can extract honey from the bees. We don’t want to take all of their honey, we only want to take a small portion of their honey and that way they’ll have enough honey in the hive to maintain themselves through the winter when there is no nectar available for them to have food. Obviously, there’s the safety equipment. Your veil, which is probably the most important item. This is the safety item that keeps the bees from stinging around your head and neck. The bees do not like your breath. The CO2 in your breath is something that will anger the bees terribly, so they’ll come right out of that hive and they’ll sting you right around your mouth and eyes. You don’t want to be breathing close to the bees, you want to try to not breath down inside the hive. When you first open a hive you want to kind of get a feel for how the bees are going to react. You’ll have some hives that the bees are more aggressive than others. Some hives you can open up and they pretty much ignore you. Other hives you open up and they’ll come after you with some real anger. So it is really important to have the veil. The veil protects you and if the bees are angry you can back off and that way hopefully you won’t get stung. In addition to the veil, you’ll need a bee suit and gloves. Commercial beekeepers sometimes don’t wear gloves and a bee suit, they may only wear a white long sleeved shirt and maybe blue jeans. They do this because they know that chances are if they work the bees properly and carefully they’re not going to get stung all that often and the bee suits are very uncomfortable in the hot summertime. The other tool that you’re going to need is a hive tool. This is just a flat piece of metal that allows you to pry the boxes apart. The bees will glue everything together. The glue the boxes together. The boxes just sit on top of each other and the bees will use what is called propolis – and that word is said differently in different parts of the country, there are different pronunciations of that depending on where you live. Propolis is the glue, it’s not beeswax. It’s similar to beeswax, but it actually contains things like pinetar, any kind of grease that the bees collect may be put into this propolis and this is used to glue things together to seal out cold air and that type of thing. The bees will actually close off little cracks in the hive to make the hive exactly what they want as far as a home. The beehive tool is what you use to pry these boxes apart. It also allows you to scrape beeswax off of areas inside the hive where there’s not supposed to be beeswax collecting. 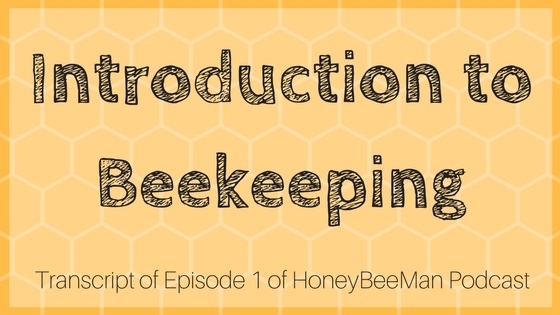 To get started beekeeping you want to read up on beekeeping basics. There are some excellent basic books available at your public library that can give you a wealth of information to get started. In addition to this, it’s very helpful to find a beekeeper in your area that would be willing to work with you to learn beekeeping before you get started. I would highly suggest that before running out and purchasing your first bees, an extractor, and equipment and all of this kind of thing that you hook up with a local beekeeper and allow that beekeeper to teach you and train you. The way you do this is volunteer to help them with their hives and you’ll learn a vast amount of information about how the hives work. Typically the beekeepers that have hives nearby will have several hives, so you can see some good ones and some bad ones, you’ll see queens that are doing excellent and queens that are not doing so well, and you can see the differences between the hives. That’s a very good educational opportunity, to find a mentor who can help you with learning about the bees. There is lots of information on the internet about bees, so with some Google searches you can find all of the tools, the equipment, and the actual bees that you need. There are several bee publications, The Bee Journal and Bee Culture. Those are pretty helpful, also. One thing about beekeeping is that no two beekeepers are going to do the same thing, everybody has their own ideas of what works and what doesn’t. Pretty much make up your own mind what works for you based on the information you know about, and continue to read information and keep up with what’s going on and what the new developments are as far as all the diseases and pests, that type of thing that can damage your honeybee colony. With that, we’ll finish up this short lesson and we’ll have more lessons that cover things like pollination, how to choose a site for a bee yard, all of the equipment and protective gear, installing packages, how to inspect the hive, diseases and pests, types of honey, how to get the honey, how to extract honey, we’ll talk more in depth on propolis, wax, Africanized Bees, Killer Bees, how they’re affecting, and then we’ll have some quick lessons on equipment, supplies, material, the best type of hive to use (there are many different types of hives), we’ll answer some questions like “why are beehives white” and how to find local beekeepers.